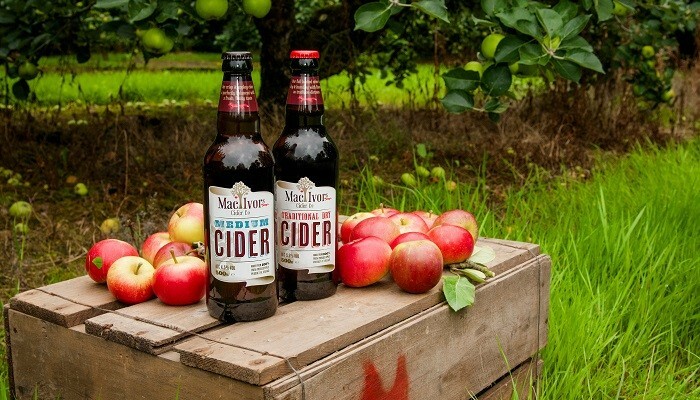 For over 150 years the MacNeice family has been growing and nurturing apples in their orchards in County Armagh. With over 100 acres of wonderful apple trees this is no easy task. But cider maker Greg MacNeice has learned from the best – his dad Sammy, who, like his father before him, has kept this family tradition alive. Greg is now the 5th generation apple grower. Mac Ivors Cider Co is based in the orchards at Ardress where Mac Ivors Traditional Dry Cider, Medium Cider and Plum and Ginger Cider are produced. It all starts with an apple and ends with great tasting pints of cider. People love the deep, dry taste of our Traditional Cider, our light, fresh and fruity taste of our Medium Cider and the burst of heat and flavour in our Plum and Ginger. In 2015, Mac Ivors Cider Co was overall Cider Champion at the prestigious International Brewing and Cider Awards. In 2016, Mac Ivors Cider Co was awarded a silver in Blas na hEireann for Traditional Dry and Plum and Ginger ciders. It was voted best Artisan producer in Armagh, joint best in Ulster and joint best in Ireland. The team picked up Great Taste Awards for Traditional Dry and Medium ciders and were awarded a silver medal at the Irish Quality Food and Drink Awards. In April 2017, Greg picked up three gold medals for the three cider varieties at the International Brewing and Cider Awards.